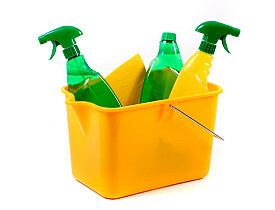 Since many cleaning products do not include labels with a list of ingredients, consumers can check the Material Safety Data Sheets (MSDS) website to learn more about the products. If a product's ingredients read like a Who's Who of gibberish, you probably don't want to spread it around your home or let your loved ones breathe it. One of the common cleaning products that claims to be non-toxic, but has a questionable pedigree, is Simple Green. According to a study conducted by Women's Voices for the Earth (WVE), some of the purportedly non-toxic Simple Green products, manufactured by Sunshine Makers, contain 2-butoxyethanol. The Simple Green website states, "Our Mission: As a socially responsible company, Sunshine Makers, Inc. is committed to being the worldwide market leader, providing quality, environmentally safer cleaning products." However, the Agency for Toxic Substances and Disease Registry (ATSDR) says this about 2-butoxyethanol: "Exposure to 2-butoxyethanol...occurs mainly from breathing air or having skin contact with household products containing them. Breathing in large amounts of 2-butoxyethanol... may result in irritation of the nose and eyes, headache and vomiting. 2-Butoxyethanol has been found in at least 20 of the 1,430 National Priorities List sites identified by the Environmental Protection Agency." In summary, this ingredient is decidedly not non-toxic. Carol Chapin, Vice President of Research & Development for Sunshine Makers Inc., responded, "While original Simple Green All-Purpose Cleaner does contain 2-butoxyethanol - which has been reported on the product MSDS since it was put on the market 35 years ago - and since the definition of "green" has evolved, our company has continued to formulate and provide to the public cleaning formulas that meet efficacy, economy and environmental/safety demands." The company elaborates that 5 of its 8 Simple Green Naturals are certified by Green Seal that they are formulated with 100% naturally derived ingredients. "We use naturally derived ingredients whenever possible from corn, sugar cane, coconut and palm. When we cannot find a plant-derived ingredient that performs to our rigorous standards, we use ingredients from the world of safe synthetics. These are materials with a long history of safety and efficacy in use for people and the environment they live in. At Mrs. Meyer's Clean Day, we do our best every day to make our formulations as natural as possible without compromising freshness, and performance." Rather than risk being duped by false eco-safe claims or introduce more unnatural substances into your home, opt to clean your home with products such as baking soda and vinegar. If they are safe enough to eat, then they are safe for your home and won't hurt our planet.